This young lady is really enjoying her coffee break. What is she looking at? 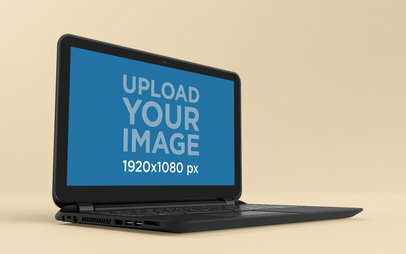 Well it could absolutely be your new website cleverly placed in this Placeit HP laptop template. 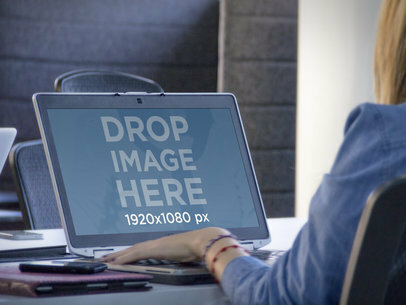 A stylish black HP Laptop sits atop a natural wood table in an angled landscape position with a young woman poised to surf everything your website has to offer. The room behind her fades away and she couldn’t be happier that your product provides the escape she needs while enjoying her coffee. If your target demographic is young and busy millennia who love to multitask, then this is the template for you. The modern generation knows how to work smarter not harder and are constantly connected to the hottest and newest websites. 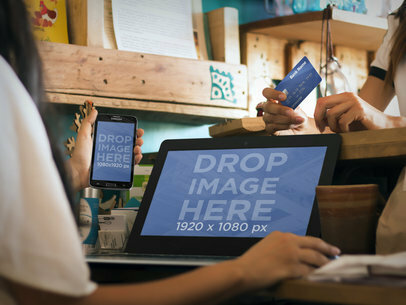 Your website showcased on this black HP laptop screen really brings this expertly designed scene to life and connects you to your customers. It’s so easy to make this template your own. 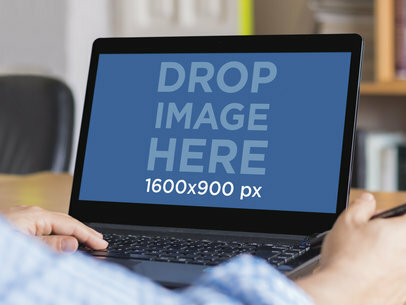 Just drag and drop a screenshot of your website directly onto the HP screen or click "Grab Screenshot from URL" above the photo and type the URL when prompted. 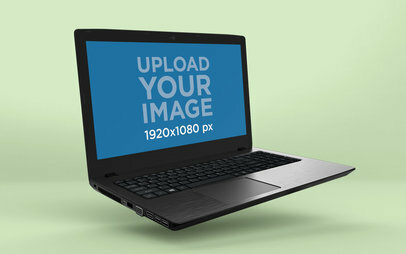 Placeit will do the alterations for you for a custom Placeit HP Laptop mockup. 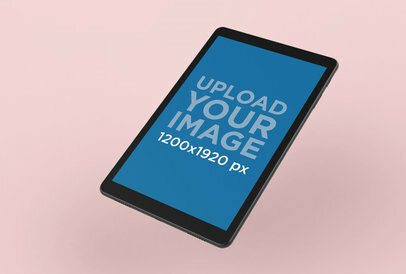 A Asus mockup, perfect for apps or websites with a casual use. The Asus sits on a beautiful, striped wooden desk, next to a cup of coffee. This stage is ideal if you&#8217;re looking for a creative, casual environment. The plants in the background help nail the organic ambience that contrasts with the cold aluminum case of the Asus. 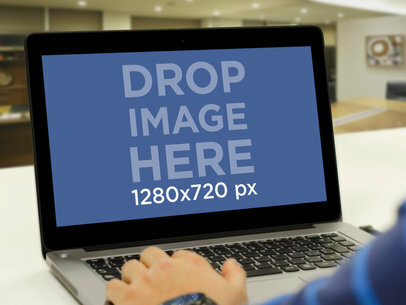 This stage allows for a 1280&#215;960 px image, or any URL. 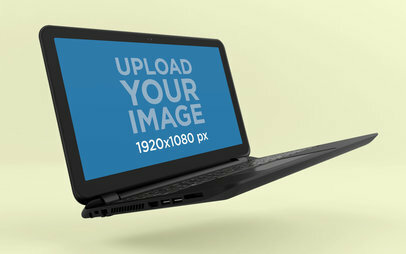 This is a mockup template showcasing an ASUS laptop at a strong angle with a netbook in the background. Also, in the background we have a stack of paper, a hard drive and another monitor. The setting is a work environment. This is a great product mockup for anyone focusing on the creative industry. The template could work well for a very wide range of apps. It could even work well for a consumer app. 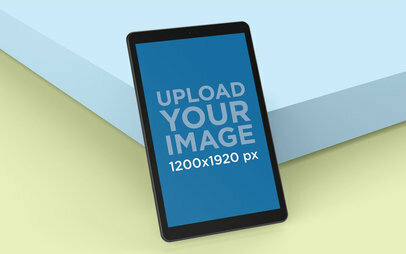 Place your screenshot for your apps on this extra large, mockup. 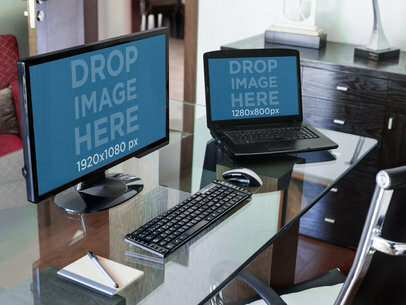 The black laptop sits on top of a beige tabletop. Behind the stage is a white wall with a window. The small view outside the window shows greenery, as in a garden. The stage itself is a closeup of the laptop at a right angle. 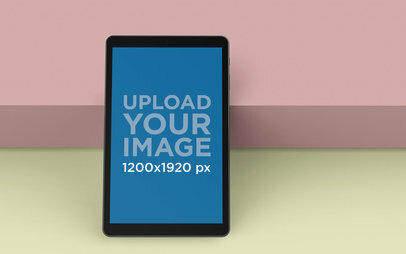 A huge 1366 x 768 px stage displays your product over 80% of this image. 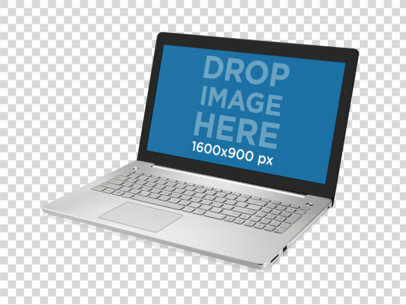 This expertly designed Placeit Toshiba Laptop marketing template is truly a must if you’re looking to capture the attention of today’s young generation. 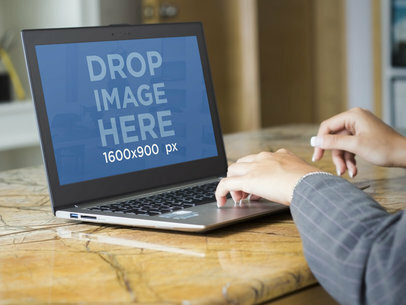 A beautiful young girl sits in a library, hotel, or after school program checking out your new website on a black Toshiba Laptop in angled landscape position. With a sleek, minimalistic backdrop, the young girl using your website takes center stage. Clearly she can happily enjoy your website from anywhere. Whether it’s a homework helper, social media or gaming website, she’s the perfect example of your target market. All that’s missing in this scene is your website. 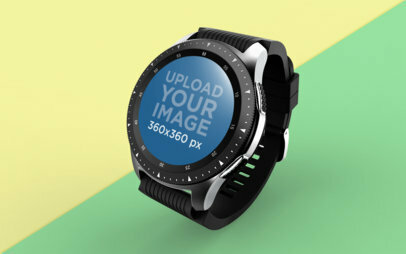 Make a custom mockup now. 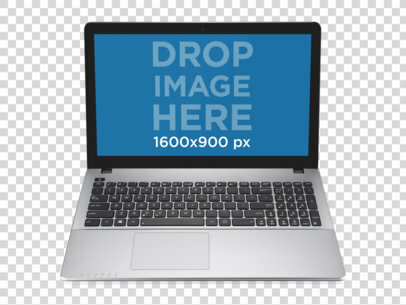 Just drag and drop a screenshot of your website directly onto the Toshiba Laptop’s screen or click on the "Grab Screenshot From URL" button above the photo and type in the URL as prompted so Placeit can adjust it for you. Placeit marketing tools take your marketing strategy to the next level. Are you looking for a creative and effective way to market your new website? Choose Placeit marketing tools to grab your potential customers’ attention with a variety of professionally designed templates. 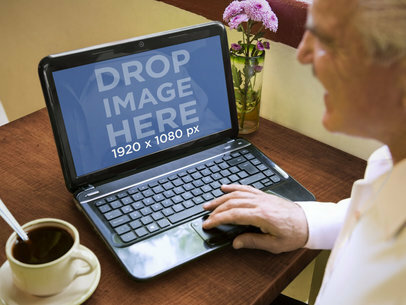 This one is a vibrant scene featuring an elderly gentleman using a black HP Laptop atop a bright green table while he enjoys a cup of coffee. A vase of pretty violet flowers artfully completes the scene to showcase your new website on the HP Laptop in angled landscape position. The retiree demographic is a huge consumer group who has the time, appreciation and know-how to really get the most out of life and your new website. 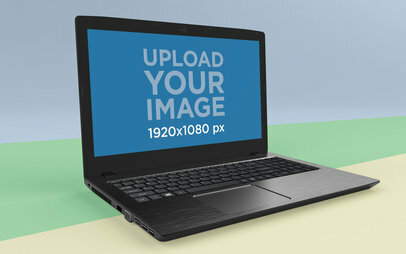 See this scene at its best with your website front and center on the HP Laptop now. 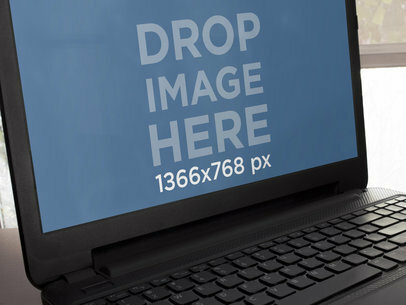 Just drag and drop a screenshot of your website directly onto the HP Laptop or click on the "Grab Screenshot From URL" button above the photo and type in the URL as prompted so Placeit marketing experts can do it for you. Don’t miss out on this unique Placeit marketing template. 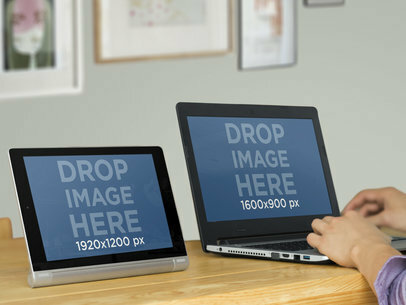 See more Windows mockups here! Have you created an amazing new website or blog, that you want to share with the world? Then consider partnering with Placeit with your online marketing strategy. How does it work? 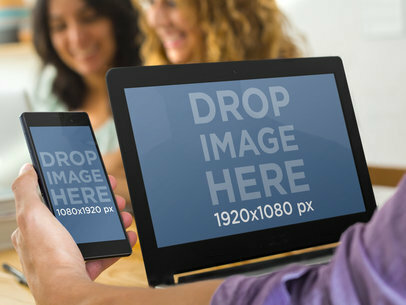 It's really easy; first you pick a mockup template with a scene that fits your needs and speaks to you, next you drag a screenshot from your website and drag it onto the screen or screens of the template, then you can download the template with your screenshot and you'll have created an amazing marketing tool for your use. 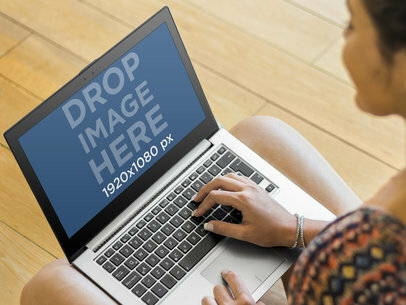 Take this fun scene for example; it features a young woman, sitting on the floor, relaxing with her Asus laptop. The stunning wood floor she's sitting on, provides an elegant background for this scene. You can see the smile on the side of her face, as she gazes down at her Asus, you can feel how happy she is. But the real star of this scene, is that big beautiful screen that belongs to that Asus laptop mockup template. That screen is angled perfectly for your detailed screenshot. All you need to do is add it to this scene and suddenly it's your website that's making this young woman so happy! There is a lot going on in this mockup. A young blonde woman is sitting at a long, white table. She is working on a white laptop. The sound cancelling panels in front of her suggests she is in a library. There is someone unseen, sitting across from her to her left using the same type of laptop. Her nails are painted a dark color. She is wearing two friendship bracelets on her left wrist. She is wearing a light, denim blouse. On the table next to her are an iPad in its notebook and an iPhone. 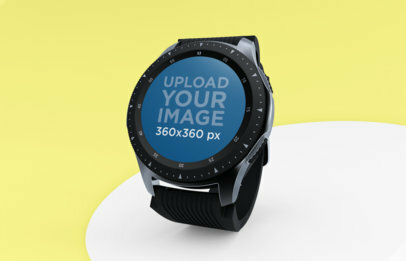 This is an intelligent, working mockup for your product screenshot. The stage is a large 1920 x 1080 px. 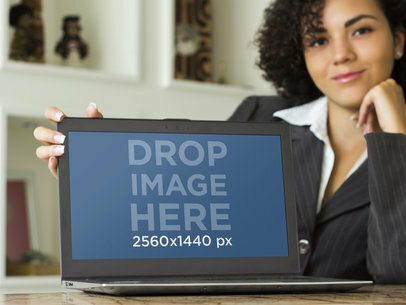 This compelling Placeit stock photo mockup template has a lot to offer. 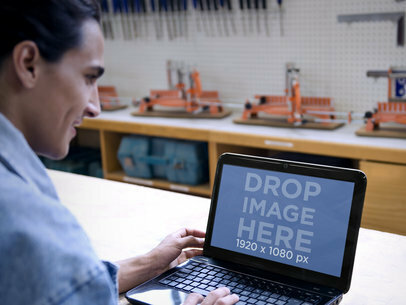 It features a young man in an industrial workspace using your new website on a black HP Laptop in angled portrait orientation. 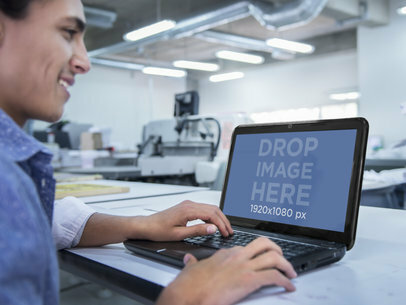 Whether he’s a building designer, mechanical engineer or inventor, this stock photo template tells a persuasive story of the necessity of your new website for a very specific target market. Promote your new website in stylish marketing tools that are tailored to your needs. 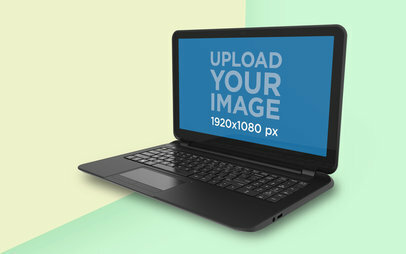 Bring this scene to life with a custom mockup featuring your website on the HP Laptop. 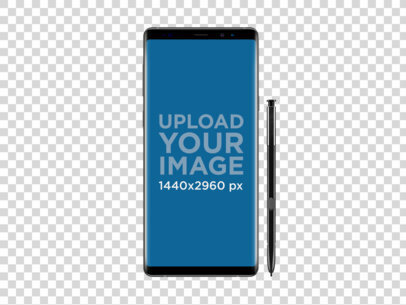 Just drag and drop your desired screenshot onto the template or import a screenshot from a URL by clicking the "Grab Screenshot From URL" button and type in the URL so Placeit can do it for you. Don’t hesitate, choose Placeit marketing tools today. 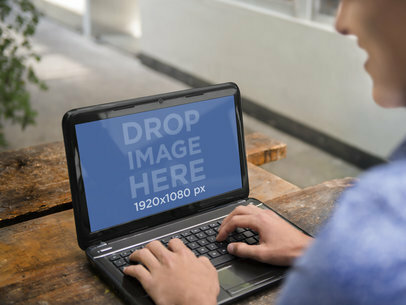 This winning Placeit stock photo mockup features a young man typing away on a black HP Laptop in angled landscape position while sitting outdoors at a wooden-topped table. 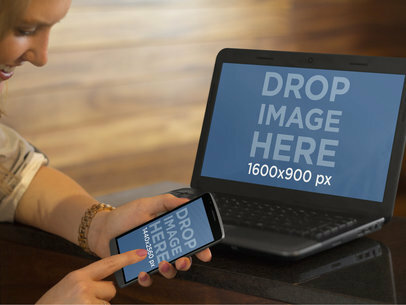 See this Placeit stock photo mockup come to life with the vibrancy of a digital image of your new website expertly placed within the HP Laptop device. 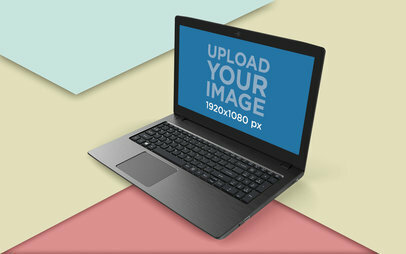 The neutrally colored background cleverly directs all the attention to your new website on the HP Laptop. The possibilities are endless with this versatile scene. 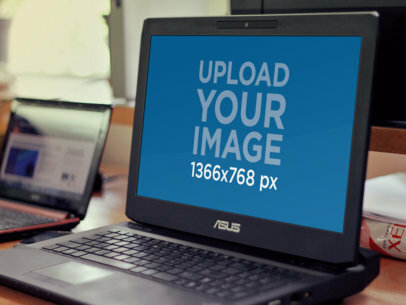 Create a custom mockup fast; just drag and drop your desired screenshot onto the HP screen in the template or import a screenshot from a URL by clicking the "Grab Screenshot From URL" button and type in the URL and Placeit will happily do it for you. 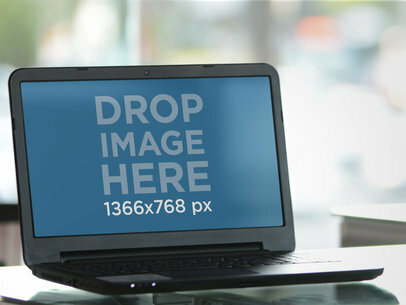 Appeal to a wide variety of consumer groups at a glance now with this winning HP Laptop stock photo mockup. 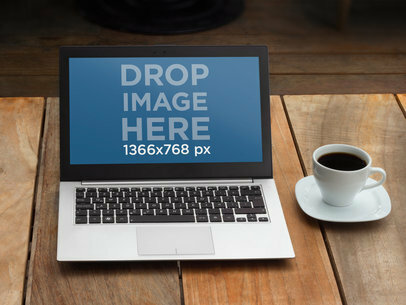 A laptop sits on a wooden restaurant table next to a cup of coffee. 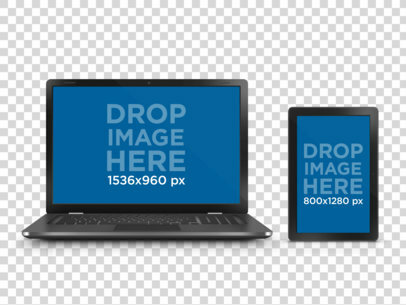 The laptop is tilted towards the right and holds a mockup image of up to 1366x768px. In the background a red brick wall gives way to a dark metal window. More wooden tables are present. The set is perfect for a management website or social website. 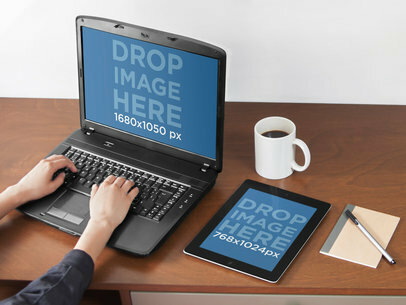 This stock photo template features a black laptop on top of a wooden table in a living room, next to a coffee mug and a notepad. 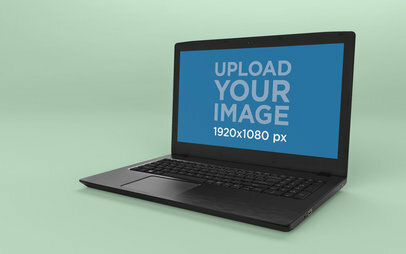 Use this laptop mockup to showcase your new web app or website in a realistic way and appeal to your consumers immediately. 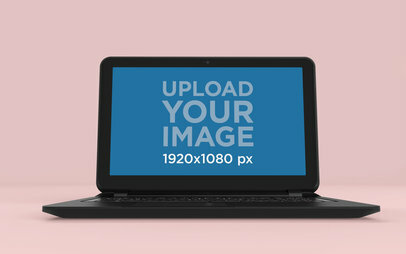 To use this mockup just drag and drop a screenshot of your website onto the laptop's screen on the template so Placeit can resize it and adjust it for you. 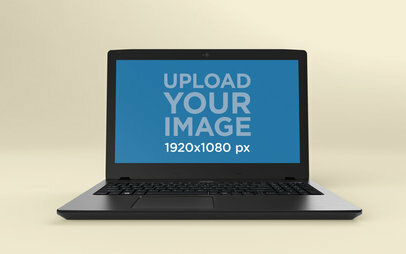 Get amazing visual content today by making Placeit part of your marketing strategy right away! This scene really lends itself to a specific mechanical and industrial target market. 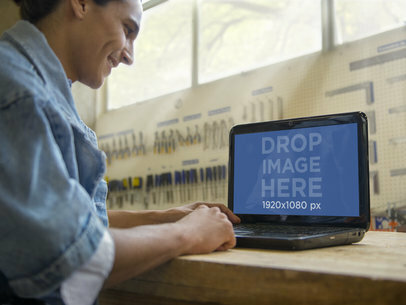 It’s bright, precise and features a man in an industrial workshop using a black HP Laptop in landscape orientation to access your new website. A number of elements are organized perfectly here to depict the perfect setting to catch your potential customers’ attention. 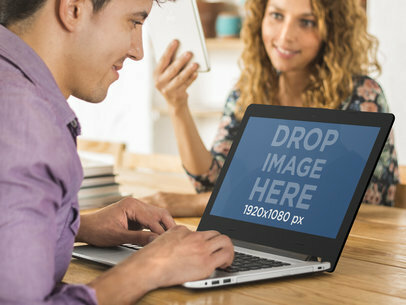 Whether it’s a build-it-yourself or measuring conversation website you’ve created, this stock photo will frame it attractively and leave a lasting impression. 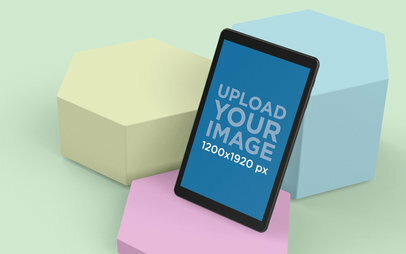 Placeit marketing tools are always polished and professional looking so get started now with a custom mockup of this stock photo template. It’s fast and easy. All you have to do is upload your own screenshot of your website onto the HP screen or input the URL so Placeit can do it for you. Take your marketing strategy to a professional level with Placeit marketing tools. This laptop mockup features an Asus laptop on top of a dinner table, next to a breakfast setting. 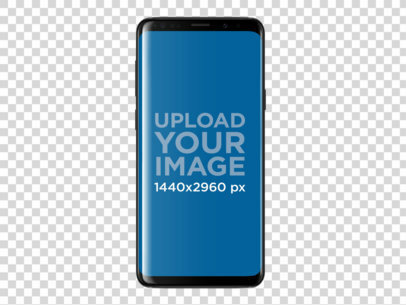 Use this amazing stock photo to display your new app or website in a real-life scenario and appeal to your consumers at a glance. All you need to do is drag and drop a screenshot of your app/website onto the template or input the URL so Placeit can do the rest for you. 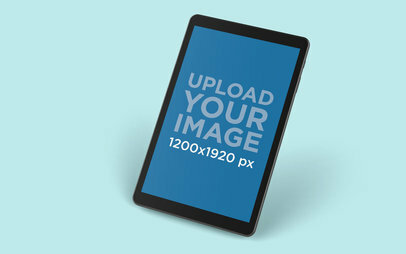 Be bold and stand out from the competition right away by making photo mockup part of your marketing strategy today! 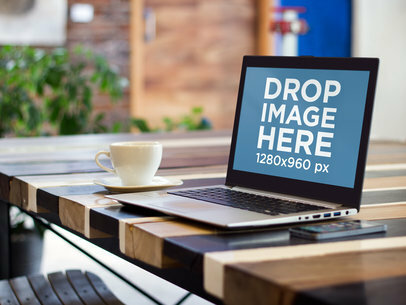 Place your product screenshot into this rustic coffee-shop setting. 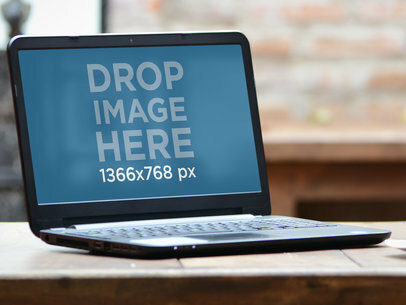 A black laptop sits on an unfinished wooden table. The tables and chairs in the background are also made of wood. There is a brick fireplace in the center of the background. To the right is a coffee bar below pained glass windows. 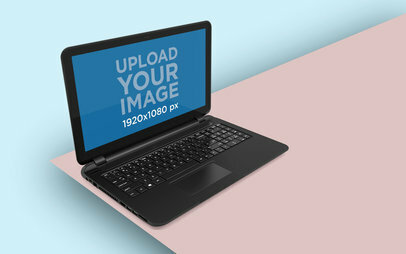 The laptop mockup stage is a landscape 1366 x 768 px.